The illicit antiquities market is, naturally, clandestine. The illicit trade in antiquities from conflict zones, particularly conflict antiquities—illicit cultural property that is stolen, smuggled and/or sold to fund political violence—may be highly politicised; it is very likely to involve violent, organised crime groups or networks, including paramilitary organisations and terrorist movements. Thus, it is extraordinarily difficult to gather reliable, detailed information on the functioning of that trade. Nonetheless, it may be possible to piece together evidence of the structure of the market from open-source data. Adapting an established method for studying the scale of the illicit market in Cycladic figurines (which is small and has not been disrupted by violence), this article gauges communities’ participation in the looting during the civil war in Cyprus. The article does not assume, accept or imply that whole communities engaged in looting. However, because archaeologists have written ethnic histories of antiquities looting, it is necessary to use community-level data to analyse those histories. The article demonstrates that, before the conflict, despite the existence of a licit market, the market was already flooded with illicit material; and that, during the conflict, the illicit trade grew further, and trafficking was controlled by organised criminals and armed groups. The data analysis also reveals social changes within the trade. Before the conflict, while members of both Greek Cypriot and Turkish Cypriot communities were involved in looting, the majority Greek Cypriot community was responsible for the majority of the looting. During the conflict, when much of the minority Turkish Cypriot community was enclaved and impoverished, suddenly members of the minority community did perhaps the majority of the looting. However, during this period, Greek Cypriot private collections were established under a secret agreement with the state (the by then Greek Cypriot Republic of Cyprus), which supposedly comprised only antiquities that had been looted by Turkish Cypriots beyond state control. Nevertheless, as will be demonstrated, almost half were antiquities that had been looted by Greek Cypriots within state control. So, during the civil war, Greek Cypriot communities were far more involved in looting than has been recognised; Greek Cypriot antiquities collectors violated their secret agreement with the state; the state legalised those antiquities collections that violated their secret agreement; and Greek Cypriot archaeologists published antiquities collections that violated the secret agreement. It seems that the antiquities policy of the Republic of Cyprus was one of the significant causes of these processes. Despite the (1571–1878) Ottoman colony’s protection of some cultural property from the eighteenth century on (see Mariti 1769, cited by Walsh 2010: 251) and increasingly careful licensing of excavations from the nineteenth century on (Stanley-Price 2001: 269), and notably despite the (1878–1960) British colony’s then comprehensive legislation, pillaging of historic sites and unlicensed excavation of archaeological sites persisted. During late Ottoman imperial rule of Cyprus, antiquities-collecting foreign officials propelled an ‘alarmingly lively’ antiquities trade (Leriou 2008: 3). Local patriots like Demetrios Pierides felt compelled to assemble their own collections, in order to keep the cultural heritage of the island on the island. Ironically, Pierides, the British consul, introduced antiquarianism to his vice-consul, Robert Hamilton Lang (Goring 1988: 8), who then extracted thousands of antiquities through unlicensed excavations. Compounding the problem, Lang spurred the interest of the soon-notorious American consul, Luigi Palma di Cesnola, who proceeded to dig up and buy tens of thousands of antiquities (most through illicit means). Di Cesnola smuggled and sold thousands of artefacts to the Metropolitan Museum, the British Museum, the Louvre, and even to the institution of the pillaged state, the Ottoman Museum of Constantinople (Myres 1974 : xvii). These problems persisted when the island passed under the control of the British Empire (through its administration first as an Ottoman territory, then as a British one, then its governance as a British colony). For instance, the work of a British Museum and Cyprus Museum archaeologist, Max Ohnefalsch-Richter, was funded by the sale of his excavated materials and other looted objects (Brönner 2001: 198; Fivel 1996: 29). For another example, the first and second “Lambousa treasures” are Late Antique (Byzantine) silver hoards that were found at the site of Lambousa in 1897 and 1902 respectively. The British Museum ‘turned a blind eye to the manifest impropriety’ and bought part of the first Lambousa Treasure (Merrillees 2009: 13), and the Metropolitan Museum of Art accepted a US antiquities collector’s donation of part of the second Lambousa Treasure (Merrillees 2009: 3–4), despite Greek Cypriot dealers having semi-legally or wholly illicitly traded the silver hoards, and foreign collectors having illicitly exported the assemblages. Between 1882 and 1935, archaeological work was administered by the Cyprus Museum Committee. Many committee members were antiquarians, so they distributed excavation and export permits corruptly, and they paid themselves high prices for their excavated artefacts (Given 2001: 255; Farrell 1909, cited in Merrillees 2005: 196). A member of the British School at Athens, Wilfrid Jerome Farrell, judged the Committee’s activities to be ‘treasure hunting’ (cited in Merrillees 2005: 197); and illicit antiquities trading became a ‘widespread evil’ (Markides 1914: 3). In 1935, the British Crown Colony (1935: Art. 3) established the Department of Antiquities, which declared that ‘all antiquities lying undiscovered’ were government property, professionalised the conduct of archaeological work, and thus ended the Committee’s exploitation and subversion of antiquities administration. With time, Cypriot communities came to support cultural property protection (Megaw 1951: 3). In fact, eventually, despite (and indeed partly because of) the Greek Cypriot nationalist revolt against British colonial rule in 1955, due to full employment and increased security, there was nearly no illicit digging (Megaw 1955: 4). After the 1960 establishment of the independent, bicommunal Republic of Cyprus, the Cypriot archaeological profession was confident that it would completely ‘stamp out illicit digging and trading in antiquities’ (Karageorghis 1963: 5). Yet civil war, Turkish Cypriot impoverishment, Cypriot and foreign antiquities collectors’ demand, and Greek Cypriot antiquities policy conspired to create a looting crisis even greater than the colonial plunder of the island. On 21st December 1963, the nationalist paramilitaries pushed the island back into the mire of violence. The “anomalous conditions” are commonly characterised as an intercommunal conflict, but they constituted a civil war (Sambanis 2004: 822; Varnava 2013: 113). Along with the civil war, ‘systematic looting’ erupted. ‘Most… extremely poor’, the looters ‘riddled’ landscapes with robber trenches (Hopkirk 1972: 6), ‘systematically obliterating’ an ‘entire Mycenaean city’ and ‘thousands of tombs’ (Hopkirk 1971: 4). According to the official and public narrative, Turkish Cypriots looted, and Greek Cypriots (and diplomats) bought (Karageorghis 2007: 102). In order to “rescue” looted artefacts from the international art market, the government also reached a ‘“silent accord”, allowing [Greek] Cypriots who had access to the Turkish [Cypriot] enclaves to buy’ illicit antiquities (Karageorghis 1999: 17; see also Karageorghis 2007: 102). The secret policy began with a state-orchestrated violation of its own law since, as a later antiquities director accepted, all of the collected antiquities were ‘illegal in the sense that they all came from illicit excavations’ (Hadjisavvas 2001: 135). Despite the fact that at least one collector had organised teams of illicit diggers, and more than 1250 people had become collectors, to take advantage of the unprecedented opportunity (ibid. ), the state concluded the clandestine programme with the legalisation of its silent partners’ illicit collections through an amnesty in 1973. Since the Turkish Special Warfare Department-backed Turkish (Cypriot) Resistance Organisation controlled the Turkish Cypriot enclaves, and the Greek Cypriot government and its paramilitaries controlled the territory surrounding the enclaves and sometimes blockaded the enclaves, smuggling of antiquities from Turkish Cypriot paramilitary-controlled territory to Greek Cypriot paramilitary-controlled territory required the involvement of at least elements within both of those paramilitaries. In fact, the largest looting operation on the island directly engaged Turkish heroin-and-antiquities mafia, the Turkish (Cypriot) Resistance Organisation and the Turkish National Intelligence Organisation. Hence, the silent accord did not simply protect a revenue stream for looters, dealers and collectors that incentivised the pillage. 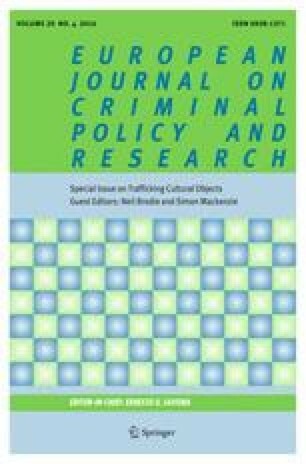 The Greek Cypriot government programme also protected a revenue stream for the Turkish Cypriot terrorist paramilitaries that engaged in plunder and/or “taxed” any smuggling (Hardy 2011: 201–215, 2014). There is some eyewitness testimony that there were Greek Cypriot as well as Turkish Cypriot looters, and Turkish Cypriot as well as Greek Cypriot collectors and dealers (e.g. Hopkirk 1971: 4); but it is very limited, it is impressionistic rather than systematic, and it has been drowned out by a mass of scholarly publications that claim to demonstrate ‘looting… in Turkish Cypriote villages—enclaves which were not controlled by the authorities of the Republic of Cyprus’ (Karageorghis 1999: 17), a system of ‘Turkish [Cypriot] looters and Greek [Cypriot]… collectors’ (Hadjisavvas 2001: 135). This study tests those assertions by analysing the data presented within those publications and others. Antiquities collection catalogues compile the scientific and historical information concerning the material in the collections recorded, ideally including comprehensive ownership records for the objects as well as a history of the collection itself. Using these catalogues, it is possible to extract raw data concerning the date, location and method of discovery of the antiquities in the possession of museums and collectors, which is otherwise only accessible through archaeologists’ and collectors’ statements regarding their own activities. This study uses data from two large public collections of Cypriot antiquities recovered before conflict and housed in France (at the Musée du Louvre) and two large private collections of Cypriot antiquities recovered during conflict and housed on the island (the Pierides Foundation and the Severis collections). Due to this article’s concern with the relationship between the illicit antiquities trade and the Cyprus Conflict, the sample collections were chosen for analysis because they were formed during two distinct geopolitical, legal and policy periods: during British colonial rule; and during the civil war. A more refined study of historical changes in antiquities collections’ sources (tied to legislative changes as well as geopolitical conditions, and properly acknowledging the violence between 1955 and 1959) would require a systematic survey of the Cypriot antiquities market. The study adapts foundational work on the sources and consequences of the trade in Greek antiquities, which studied collection (and auction) catalogues (Chippindale and Gill 2000; Gill and Chippindale 1993; Nørskov 2002: 256–270), and cross-references the catalogue data with demographic data and historical information. Thereby, it enables an exploration of the community-level functioning of the illicit antiquities trade in Cyprus, and of the relationship between the trade and the conflict. Archaeologists Christopher Chippindale and David Gill analysed the published records of Classical and Cycladic antiquities in order to determine the material and intellectual consequences of their being appreciated and collected. They drew attention to the unreliability of information provided in catalogues about artefact find-spots (2000: 469–470), categorising the security of an artefact’s provenances as: “known” or “almost certainly” known to be from a specific location; “said to be” or “allegedly” from that place; “probably” from there; or “possibly” or “perhaps” from there; otherwise, “unknown” or unstated; or stated based upon (i.e. inferred from) material and/or stylistic affinity with known objects (see also Gill and Chippindale 1993: 611n107).1 In the Cypriot context, however, their categorisation requires some modification. At the very least since the 1960s, it has been standard in Cypriot collection catalogues to list deliberate finds of excavations and surveys, and accidental finds made on the surface and during development. For example, Cyprus Museum curator and antiquities department archaeologist Kyriakos Nikolaou (1966: 28) distinguished between material ‘excavat[ed]’ or ‘collected’ (i.e. during survey) by archaeologists, and material ‘accidentally discovered’ (e.g. during development) by others. Nikolaou (1966: 41) even identified ‘pottery acquired… coming from a looted tomb’; however, as looting ethnographer Greg Deftereos (2007: 9) observed, “unknown origins” and the ‘grandfather clause’ (falsely-claimed inheritance) are used as ‘face-saving (and sentence-saving)’ ways of avoiding saying that something was looted. So, it is safe to assume that artefacts without information (or innocuous explanations of the lack of information) are probably illicit antiquities. It is even safer to assume that in the collections under study such antiquities are also illicit, because the antiquities director at the time of their formation, and a common author of all four catalogues, was Vassos Karageorghis. He is the person who described the secret state ‘policy by which Greek Cypriots were allowed to buy antiquities looted by Turkish Cypriots.... in consultation with the Department of Antiquities’ in the Pierides collection catalogue (Karageorghis et al. 1985: 14), coined the term ‘silent accord’ in the Severis collection catalogue (Karageorghis 1999: 17), and reiterated that it consisted of ‘quietly allow[ing] the purchase of antiquities from the Turkish [Cypriot] enclaves by Greek Cypriots’ then ‘giv[ing] a period of grace to all private collectors’ in his memoirs (Karageorghis 2007: 102). Subsequent antiquities director Sophocles Hadjisavvas (2001: 135) defined the collected antiquities as ‘illegal’ antiquities ‘from illicit excavations’. Thus, as regards Gill and Chippindale’s ranking of location categories, when examining the catalogues of the two museum and two private collections selected for this study, I included ‘said to be’ and ‘probabl[e]’ find-spots in my analysis as ‘known’ because archaeologists who published Cypriot antiquities repeatedly made uncertain statements, but nevertheless demonstrated certain knowledge, about the geographical/community sources of those antiquities. For example, then junior archaeologist (later antiquities director) Pavlos Flourentzos published Four Archaic Terracottas from Cypriote Private Collections, all of which were probably looted, three of which were from an “unknown” location, and one of which was ‘[p]robably from Athienou’ (1977: 153). In fact, the artefact was definitely from Athienou. Flourentzos (1977: 153) explained that subsequent ‘excavations dated the tomb in which this terracotta was found to the 5th century B.C., but the piece… dates to the 7th century’. He explicitly stated that the Department of Antiquities excavated the artefact’s find-spot and, by definition, they could not have known the tomb in which the artefact had been found if they did not even know the village in which the artefact had been found. If the reliability of the claim of the excavation is questioned (rather than the unreliability of the assertion of ignorance), neither the Department nor Flourentzos would have claimed the object’s deposition in a never-before-used region, two centuries after its production, if they were not certain of (or indeed if they knew that they did not know) both place and time, because its only effect would be to distort the historical record. The exceptional claim would be subject to exceptional scrutiny, and any hypothesised professional advantage would be lost if they could not present any evidence, such as the most rudimentary excavation records. Indeed, in one of the publications under study here, the catalogue of the Severis Collection, by then retired antiquities director Vassos Karageorghis (1999: 33) cautiously noted that it was ‘quite possible’ that particular ‘groups of vases’ had come from Marki Davari, which had been ‘thoroughly looted during the years when the Collection was formed’; then he noted that it was ‘quite possible’ that a particular dagger blade had ‘come from the same tomb’ (Karageorghis 1999: 43). He, too, would not have identified specific tombs, or reconstructed original assemblages, if he did not know where the objects had been found, or with which others they had been found. Karageorghis was already considered the ‘godfather of Cypriot archaeology’ (e.g. Carter and Morris 1998: 3), so there could have been no conceivable professional benefit from making such claims, while there could have been a great professional cost. Elsewhere, there is even more direct evidence of Cypriot looters’, dealers’ and collectors’ systematic documentation of looted artefacts’ origins, and of cultural heritage professionals’ trust in those documents, since at least the 1950s: the Zintilis Collection ‘carefully recorded’ original locations ‘wherever possible’; and archaeologists confirmed that the records comprised ‘accurate information’ (Lubsen-Admiraal 2003: 9). ‘[N]one’ of Zintilis’ antiquities was ‘recovered during regular excavations’ (ibid. : 9), which itself implies that at least some of them were recovered through irregular (illicit) excavations. ‘[M]ost’ were collected ‘in the 1950s and 1960s when this was still possible’ (ibid. : 1), while the collection, sale and purchase of accidental or otherwise licit finds is still possible now (ROC 1996: Art. 4; Art. 26). And 277 of the 280 antiquities with collecting histories only had ‘relatively reliable’ find-spots (Lubsen-Admiraal 2003: vi), whereas accidental finds (such as artefacts that were found in ploughed soil by farmers) would have had publicly-identifiable finders and absolutely certain find-spots. Indeed, the collection catalogue did identify licit finders and explain their discoveries; so, for example, it specified that artefact number 537 had come from ‘the courtyard of Mr. Zintilis’ home’, and that artefacts 59 and 201 had come from the farmers of Zintilis’ village (Lubsen-Admiraal 2003: 1). Thus, the finds with technically uncertain find-spots must have been finds with illicit origins, where the digger or dealer had told the buyer the origins of their acquisition. This information was judged sufficiently reliable to be approvingly written up by an archaeologist (Stella Lubsen-Admiraal) and published by an archaeological press (Paul Åströms Förlag) who, like Flourentzos (and his publisher, the Department of Antiquities) and Karageorghis, had nothing to gain and everything to lose by affirming and publishing unreliable or false find-spot data. By way of contrast, the publication of the Morris Collection of Cypriot antiquities by its owner, who was not an archaeologist, only provided any information at all for 24 of the 584 objects presented (Morris 1985), so the decision made by professional archaeologists to publish find-spots seems to be a free and positive attempt on their part to enter reliable evidence into scholarly record. This evidence demonstrates that archaeologists received and published reliable and detailed data on looting and illicit trading. If the information was certain, it could still be asked why the archaeologists presented it as uncertain. The first reason may be simply that it was second-hand information, so it could not be presented as if it had been scientifically recorded, but that would not adequately explain the simultaneous reporting of probable find-spots and excavations of those (theoretically-unknown) find-spots. The second (and third), more robust, reason(s) may be that the collectors’ and archaeologists’ sources (of antiquities and information) were illicit diggers and illicit dealers: the archaeologists may have wanted to obfuscate their close connections with participants in the illicit antiquities trade, and those illicit actors’ impunity. For the purposes of this study, finds from outside Cyprus would have skewed study of the Cypriot trade, and finds from vague locations within Cyprus would have skewed study of community participation (as, at the time, Greek Cypriots constituted a majority on the island and in all of its regions, so they would have been presumed responsible for all looted antiquities of indeterminate origin). Thus, artefacts definitely or likely found or first recorded outside Cyprus were excluded from the analysis. Artefacts with find-spots of “Cyprus” or its geographical or administrative regions, or with find-spots that were seemingly materially and/or stylistically-inferred, were included in the analysis of the probable legality/illegality of the collections’ sources, but were excluded from the analysis of the probable looting communities. Many published collections were assembled across significantly different periods in geopolitical and policy terms but are not sufficiently well-documented to enable reliable interpretations. Many have such piecemeal data that assuming their partially-documented objects were representative of the entire collection (let alone broader historical trends), for example by either assuming undated antiquities were from one period or the other or excluding undated antiquities from analysis altogether, could significantly misdirect understanding. Other collections are so well-documented that the generalisation of their very particular histories, bound up with archaeological regions and social networks, could similarly misdirect analysis. It is worth noting that a complete lack of information regarding find-spot and find-date does not imply that the antiquity was looted in a Turkish Cypriot enclave (during the civil war). When dealers and collectors knew from which enclave an object was looted, archaeologists recognised that fact; they recorded find-spots such as ‘Marki or Kotchati’ (e.g. Karageorghis 1999: 58), which implied that the objects were found “somewhere in this enclave” rather than “in this precise place”. There is no reason to assume that they did not record other such known find-spots. Of the four collections under analysis, two were wholly collected within one period and two were largely collected within a second period, so there is no (significant) risk of confusion. The two collections of pre-conflict antiquities should comprise a random sample of community sources, as they were published for their scientific value (Caubet et al. 1981: back cover). The two collections of mid-conflict antiquities should comprise a non-random sample of solely Turkish Cypriot sources, as they were governmentally approved (and subsequently legalised and published) as collections of material from those sources (Karageorghis et al. 1985: 14; Karageorghis 1999: 17). Though the data set is small—theoretically small enough for one person or a small group to have uncovered all of the objects—it is highly unlikely that they did so. The artefacts are from across the island, from Turkish Cypriot enclaves as well as Greek Cypriot villages, so it is incredibly unlikely that one person or a small group would have had the knowledge and access to conduct all of the work themselves. It is technically possible that one person or a small group could have acquired all of the antiquities for each collection, but that would have no bearing on the evidence of bicommunal participation in the extraction of the antiquities. Moreover, they are only the traceable few from collections of thousands of antiquities on the island. While in no way the responsibility of any community or a reflection upon any community, the extraction of tens of thousands (or hundreds of thousands) of antiquities, within the decade of civil war and under the conditions of civil war, must have involved large-scale participation. Accordingly, any evidence of looting by members of the Greek Cypriot community during the civil war would be significant, not only because it would contradict the established state—and professional—narrative that illicit antiquities diggers during that period consisted of Turkish Cypriots in the enclaves, but also because it would contradict the very bodies of evidence that were used to produce that narrative in the first place and remain standard sources that perpetuate it. The samples of antiquities collected during peacetime are from a public museum. Although the objects were acquired by one colonial state from the colony of another, their origins are still worthy of comment. It is notable that, despite the colonial system of partage that automatically ceded at least a third of an expedition’s finds to its team, 214 (67.08 %) of the 319 objects were neither scientifically excavated nor found through survey or by accident. The majority of the public collection had probably illicit origins. The samples of antiquities collected during the conflict are from private collections. Since those collections were government-mandated “salvage” collections of looted antiquities, it is not surprising that 387 (99.23 %) of the 390 objects appear to have been looted. However, it is surprising that 294 (75.97 %) of the 387 probably looted objects had no provenance whatsoever. Demetrios Zeno Pierides is said to have acted (as other private collectors who agreed to the silent accord) ‘in consultation with the Department of Antiquities’ and, whenever possible, to have ‘collect[ed] all information concerning their provenance’, in order that ‘their scientific value was not entirely lost’ (Karageorghis et al. 1985: 14). Of the 125 artefacts in the catalogue (Caubet et al. 1981), 74 (59.20 %) came from archaeological excavations, missions, etc. (due to colonial archaeology’s partage system, wherein excavators kept some of the sites’ artefacts), but still 51 (40.80 %) were probably looted before conflict. three were from the Turkish Cypriot village of Sinda. So, 16 (84.21 %) were probably looted by Greek Cypriots, and three (15.79 %) were probably looted by Turkish Cypriots (Fig. 1). one was probably looted from Greek Cypriot Trikomo. So, of the 66 artefacts from Cyprus with fairly reliable find-spots, 60 (90.91 %) were probably looted by Greek Cypriots and six (9.09 %) were probably looted by Turkish Cypriots (Fig. 2). Excluding the 4.7 % of non-Cypriots (such as the British), who generally collected rather than looted (thus, as percentages of the remaining 95.3 % of the total population), Greek Cypriots (who encompassed the constitutionally-recognised Armenian, Latin and Maronite minorities as well) were 80.90 % and Turkish Cypriots (who encompassed the constitutionally-unrecognised Linovamvaki and Roma minorities as well) were 19.10 % of the population (Cucó 1992: 17). Thus, the albeit small samples’ 84:16 or 91:9 participation ratios accord reasonably well with the demographic ratio and suggest that both communities engaged in illicit antiquities digging without any significant connection between community membership and looting activity. The disproportionately high representation of Greek Cypriot involvement may be a product of the small sample size, but if it did prove real, it would not be surprising, as the primary collectors of Cypriot antiquities lived and worked disproportionately amongst the Greek Cypriots with whom they shared a language (to a functional extent) and a religion (Şevketoğlu 2000: 122); they had more immediate access to Greek Cypriot looters and dealers. Two volumes of antiquities have been published (in 1973 and 2008). Because there is no earlier inventory, it is impossible to know exactly how many antiquities Demetrios Pierides added to his strand of the family collection between 1967 and 1972, but Karageorghis (1999: 17) identified it as one of the ‘most important’ collections that was (largely) ‘formed’ under the silent accord. Its June 1972 inventory counted 2236 objects (Pierides 1973: 9), and its 2008 inventory counted around 4000 (Leriou 2008: 2), of which around 800 were added between June 1974 and 2008 (Leriou 2008: 6), so Demetrios Pierides added about 964 antiquities between June 1972 and June 1974 alone. In the first volume, the antiquities with find-spots were ones that were ‘acquired’ by Pierides ‘himself during recent years’ (Karageorghis 1973: 13), so it is safe to assume that they were antiquities looted during the conflict (unless acquisition dates show otherwise). Likewise, in the second volume, find-spots were recorded ‘[w]henever it was possible’ (Karageorghis et al. 1985: 14), and it would not have been possible when acquiring material from the (ostensibly legal) international market (which could not acknowledge illicit origins), so it is safe to assume that antiquities with find-spots were looted during the civil war. Seemingly corroborating this observation, many of the antiquities with find-spots were from south Cyprus (though theoretically they could have been looted in southern Cyprus between 1974 and 2008). one was from Greek Cypriot Philia. So, of the 16 conflict antiquities with find-spots in the 1973 catalogue of the Demetrios Zeno Pierides Collection, ten (62.50 %) were probably looted by Turkish Cypriots during conflict; and six (37.50 %) were probably looted by Greek Cypriots. All of the 282 artefacts in the 1985 catalogue were probably looted; but 265 had no information whatsoever, so they have been excluded from analysis. one was from Greek Cypriot majority mixed Paphos. So, of the 17 conflict antiquities with find-spots in the 1985 catalogue of the (by then) Pierides Foundation Museum Collection, nine (52.94 %) were probably looted by Turkish Cypriots during the conflict; and eight (47.06 %) by Greek Cypriots (Fig. 3). nine were from Turkish Cypriot Souskiou. So, 42 (54.55 %) were probably looted by Turkish Cypriots, 35 (45.45 %) by Greek Cypriots (Fig. 4). The apparent Greek Cypriot:Turkish Cypriot participation ratios vary greatly: from 37:63, to 45:55, to 47:53. Since the most dissimilar ratios are from the same collection at different times, the difference is most likely an insignificant product of the small sample size. Simultaneously, that shows that each set of numbers is unreliable in and of itself. Still, all three show disproportionately high Turkish Cypriot participation in antiquities looting during the civil war, which suggests that the general impression is reliable. Even if—even though—the numbers are not precise products of comprehensive sampling, they corroborate each other, and they corroborate the historically-attested trend towards disproportionate Turkish Cypriot engagement in looting during the civil war. Theoretically, since the collections were designed to acquire Turkish Cypriot-sourced material, Turkish Cypriots’ ostensibly disproportionate participation in looting might be an entirely false impression, created by the biased acquisition policy. Indeed, the only reason to accept the collections’ sources as a significant reflection of the reality of the trade is the collections’ manifest disregard for the unwritten rules of the silent accord by their inclusion of artefacts from Greek Cypriot locations. It is also important to remember that a lack of information does not imply a Turkish Cypriot source. Dealers and collectors recorded even vague origins “either here or there” in Turkish Cypriot enclaves (e.g. ‘Marki or Kotchati’ (Karageorghis 1999: 58)), and archaeologists equivocated about known origins in Greek Cypriot villages (e.g. ‘[p]robably from Athienou’ (Flourentzos 1977: 153)). Indeed, dealers and collectors were actively incentivised to place origins in Turkish Cypriot enclaves, because that would secure them licences for their illicit antiquities. So, if there is any distortion in the representation of sources of illicit antiquities, it will give a disproportionately high impression of looting by Turkish Cypriots and a disproportionately low impression of looting by Greek Cypriots. More significantly, then, the collections should not have shown any Greek Cypriot participation at all—but they did. Since they should have shown solely Turkish Cypriot participation, the key finding in this analysis is the concrete evidence of Greek Cypriot looters’ activity, Greek Cypriot collectors’ acquisitions from those looters and Greek Cypriot archaeologists’ turning of a blind eye to this supply line. To some extent, this analysis corroborates the official (Greek Cypriot) history of looting in Cyprus. The Turkish Cypriot minority’s participation in looting increased significantly, and possibly constituted the majority of the looting, during the civil war. It is unsurprising that Turkish Cypriot participation increased so greatly, because the Turkish Cypriot community was greatly impoverished (Panayiotopoulos 1995: 23). Obviously, it is also unsurprising that so many Turkish Cypriot-looted artefacts entered Greek Cypriot private collections, because the Greek Cypriot professional archaeological community supported Greek Cypriot private collectors in buying Turkish Cypriot-looted antiquities. Indeed, it is more surprising that, despite a secret state policy to permit and encourage the acquisition of looted antiquities specifically and solely from Turkish Cypriot looters, the collectors could not (or did not) even acquire two-thirds of their material from Turkish Cypriot sources. This article’s re-analysis disproves the official history of the conflict antiquities trade in Cyprus and calls into question the scholarship that produced that narrative. Greek Cypriot archaeologists published interpretations of the illicit antiquities trade that diverged far from the data that they themselves had compiled and analysed (and published alongside those interpretations). The divergent narrative is particularly noticeable because its primary author, who has repeatedly presented civil war looting as a Turkish Cypriot activity, had earlier published a book on the cemetery of Gastria Alaas, which is on south-east-pointing Cape Elaia, with the (historically) Greek Cypriot village of Gastria three kilometres to the north-west and the (by then) Greek Cypriot village of Ayios Theodoros Karpasias four kilometres to the north. Karageorghis (1975: 4) noted that Alaas, and two other ‘important’ cemeteries nearby, had been looted during the civil war—Alaas in 1973, the other two a ‘few’ and ‘several’ years before. Unidentified private collectors ‘bought’ antiquities from the looters of Alaas, then ‘help[ed]’ the Department of Antiquities to find the site, the remains of which it excavated (Karageorghis 1975: 1). At the time of publication, the Hadjiprodromou Collection had 93 objects from the site and the Severis Collection had 27 (Karageorghis 1975: 28–41; 41–45); the antiquities department excavated 116. Consequently, this analysis undermines the archaeological policy of looted antiquities’ “rescue” and looted antiquities collections’ legalisation. Evidently, Greek Cypriots within government control as well as Turkish Cypriots outside government control pillaged the island’s cultural heritage. Regardless of whether antiquities policy was exploited or policy-makers turned a blind eye, it has been disastrous for archaeology and the incorrect interpretation of its consequences has underpinned nationalist history-writing. Based on the data from these catalogues of private collections of looted antiquities, Greek Cypriot archaeologists have blamed Turkish Cypriots for crimes committed by both Turkish Cypriots and Greek Cypriots, which were funded by Greek Cypriots, who were supported by the Greek Cypriot administration. Their original classification system was presented in Gill and Chippindale (1993: 611n107). The author is grateful to the ESRC whose DPhil funding enabled the research, and to the three anonymous reviewers and two editors whose comments helped to improve and clarify this manuscript. Hardy, S. A. (2014). Destruction, theft and rescue of archaeological artefacts in Cyprus, 1963–1974: From the intercommunal conflict until the foreign invasions. In Nys, K. and Jacobs, A., (Eds. ), Cypriot material culture studies: From picrolite carving to proskynetaria. Proceedings of the 8th Annual Postgraduate Cypriot Archaeology Conference held in memory of Paul Åström, at the Vrije Universiteit Brussel (Belgium) from 27th to 29th November 2008. Göteborg: Paul Åströms Förlag. Available at: http://conflictantiquities.files.wordpress.com/2012/12/hardy-2012-cyprus-illicit-antiquities-trade-intercommunal-conflict-paramilitary.pdf [postprint release date: 12th December 2012].